Sanskrit Department is one of the best departments of Delhi University. The relevance of studying Sanskrit has been increased in the recent times and can offer students many avenues of intellectual and professional growth. The knowledge of Sanskrit is useful in many professional areas like media (Sanskrit news reading and other programme based on ancient culture. 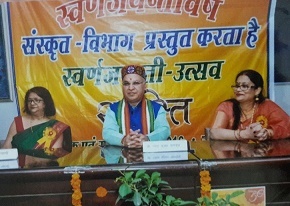 ), management (knowledge of Indian system of management of life), ayurveda, yoga, poetics, music, theater, history, philosophy of languages, linguistic, computer linguistics, animation industry and translation work. The department organise inter-college and inter-class competition every year to boost confidence of students and give them sufficient exposure to develop their overall personality. • Workshop on various issues. during annual college festival, REVERIE. • Essay writing, painting, Sanskrit paper-reading and Rangoli competition.